As the world leader in business SaaS solutions, Salesforce has been long-regarded as a pillar of the tech community in Silicon Valley. Founder and CEO Marc Benioff worked hard to build a company that not only provides a best-in-class solution for their customers but also fosters a one-of-a-kind work environment for tech talent. As a result, Salesforce has a reputation as a breeding ground for future tech executives and entrepreneurs. The CEOs of successful startups like Hearsay Social, Campaign Monitor, Crunchbase, and Act-On all got their starts working as one of the 24,000 employees of Salesforce. But maintaining a reputation as a world-class employer takes more than the promise of a great product and loyal customer base. Salesforce jobs need to come with some great salaries and perks to attract the best talent. 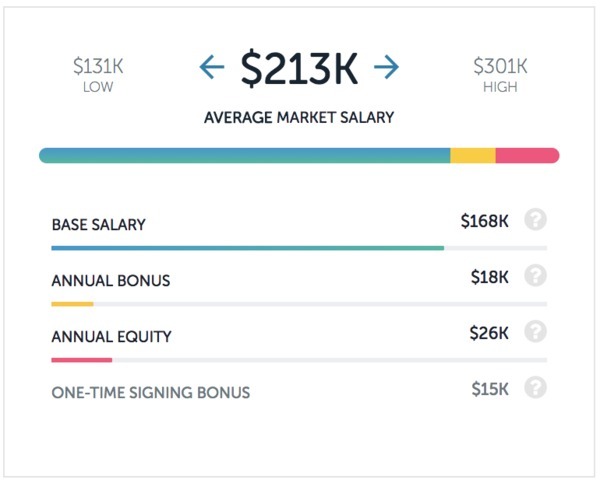 To help you figure out whether Salesforce might be a great place for your next career move, the Paysa team is highlighting the top five highest paying Salesforce jobs. We’ve narrowed in on the top individual contributor positions (leadership roles excluded), to give you a glimpse at what you can expect from a career at this tech giant. With over 20 percent market share in the competitive cloud-CRM industry, you’ll be hard-pressed to find a business owner who hasn’t at least explored the possibility of using Salesforce’s flagship product. A lot of that exposure and success can be attributed to product marketing managers, whose job it is to promote Salesforce products through the right channels and get it in the hands of their target audience. Salesforce clearly puts a lot of value in this position, as it is the highest-paying individual contributor role at the company. 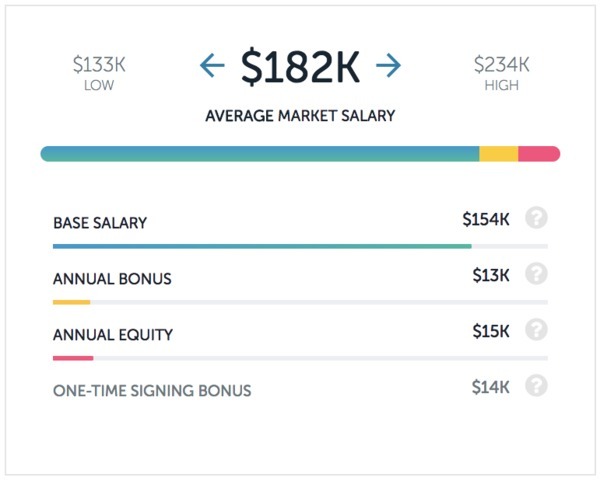 Senior product marketing manager salaries at Salesforce average out to $231,000 per year, including a $189,000 base salary, $17,000 annual bonus, and $25,000 in annual equity. Enterprise architects evaluate, select, and implement the right technology solutions to ensure Salesforce itself runs efficiently and stays on track to achieve business goals. Salesforce recognizes the importance of this position (after all, their target decision-maker when selling their solution is often likely an enterprise architect) and compensates for it accordingly. 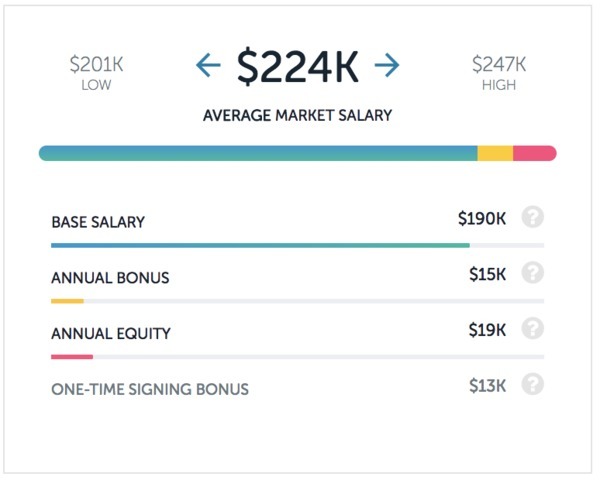 Senior enterprise architect salaries at Salesforce are around $224,000 on average, which includes a $190,000 base salary, $15,000 annual bonus, and $19,000 in annual equity. It’s no secret that the Salesforce platform is pretty complex. Not only are there thousands of little features that need to be fine-tuned to suit their clients’ businesses; there’s also a mile-long list of integrations supported by Salesforce that need to be implemented to ensure customer satisfaction. A sales engineer manages that entire process, bridging the gap between salespeople, technical teams, and the customer to ensure the Salesforce platform exceeds client expectations. As a result of such heavy demands, senior sales engineer salaries at Salesforce are some of the highest in Silicon Valley. 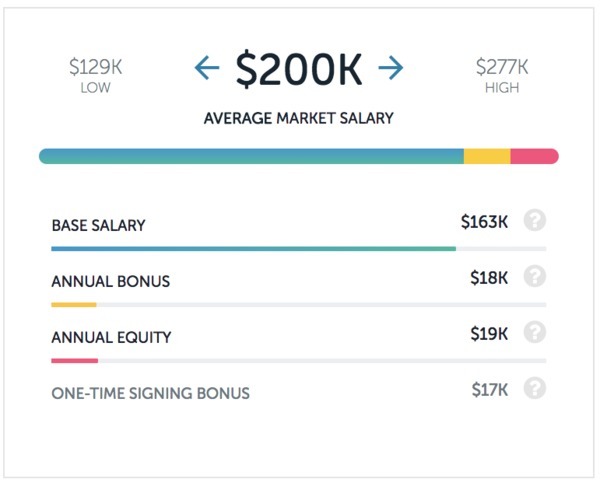 Total compensation averages out to $213,000 per year with a $168,000 base salary, $18,000 bonus, and $26,000 in equity. Not to be confused with a product marketing manager, product managers play a critical role in defining the future direction of a company’s product or service. Product marketers create the vision; product marketing managers sell that vision to a company’s audience. At Salesforce, where customer use-cases can change by the day and demand for new features can reach a fever pitch almost overnight, a great team of product managers is essential. That’s why senior product manager salaries at Salesforce are so much higher than the industry average. Total salaries average out to $200,000 per year according to Paysa, including a $163,000 base salary, $18,000 annual bonus, and $19,000 in equity each year. Rounding out our “Top 5” list of highest paying Salesforce jobs is the technical solutions architect—a position that brings together elements of the enterprise architect position discussed earlier as well as project management. At Salesforce, technical solutions architects can expect an average salary of $182,000 per year. That includes a $154,000 base salary, $13,000 annual bonus, and $15,000 in equity each year. Want to see how salaries for Salesforce jobs stack up against those at Oracle? Check out this post from the Paysa blog to see who comes out on top. You can also view open positions with Salesforce on Paysa. And while you’re at it, sign up to personalize Paysa for you! Next ArticleTripAdvisor vs. Airbnb: Who Pays More for Tech Talent?